Daughters of Romania's kings, such as Margareta, Elena, Irina and Sophie, as well as their descendants, had no rights of succession to the Romanian throne during the monarchy's existence, in accordance with the Salic law enshrined in both the defunct royal Romanian Constitution of 1938 and the Statute of the Romanian royal house, dated 1884. On 30 December 2007 in a private ceremony, King Michael issued a declaration in the form of a statute, an act of symbolic significance in the absence of its approval by the Parliament, promulgating new Fundamental Rules of the Royal Family of Romania. Michael decided to add his daughters and their children to the headship of the royal house, further explicitly banning any other foreigners belonging to any other royal or princely house from succeeding. On the same occasion he asked the Romanian Parliament to abolish the Salic law, should it consider restoring the monarchy. By the same act, Michael designated his grandson Nicholas de Roumanie Medforth-Mills as a future member of the deposed royal family and future "Prince of Romania" with the style of "Royal Highness," effective either on his 25th birthday, 1 April 2010, or upon Michael's death, whichever might occur sooner. On 1 August 2015, however, King Michael issued a declaration retracting the style "Royal Highness" and "of Romania" previously conferred upon Nicholas, also excluding him from the line of succession to the headship of the dynasty, noting that his successors in that capacity should be persons of "principled modesty and morality." Children and consorts of the members of the family who do not bear a royal title are not recognised as members of the former royal family, according to the new rules. 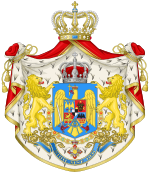 ^ See "Line of succession to the Romanian throne"
^ The Telegraph. AP. "Romania prince stripped of title by former king for lacking 'modest moral principles'". 2 August 2015. Retrieved 2 August 2016.